A good choice to shore up your guests: this is nicely restorative, without being too heavy. Start with the onions. Heat the oil and butter in a medium-size pan over a medium heat. Add the onions; cook, stirring occasionally, for 15 minutes or until the onions are soft and beginning to caramelise. Add the sugar and balsamic vinegar, then continue to cook for a further 5–10 minutes, or until the onions are caramelised. Season. For the tortilla filling, place a medium frying pan over a medium heat. When hot, add the pancetta and fry, stirring occasionally, for 3–4 minutes or until crisp. Pour over the beaten eggs. When they start to set around the edge of the pan, gently stir and turn the mixture with a spatula or wooden spoon until the eggs are just set. Sprinkle over the parmesan and chives. Gently warm each tortilla through in a frying pan set over a very low heat, then wrap them in a clean tea towel to keep warm. To serve, divide the scrambled eggs between the warm tortillas. 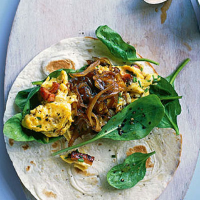 Top with spinach leaves and a spoonful of the caramelised onions, then wrap the tortilla up to enclose the filling, and eat. A pick-me-up is ideal here, so good coffee would work, but there’s really no better refreshment with this combination of tastes than a mug of English breakfast. Waitrose English Breakfast Tea (£1.39/50 bags). This recipe was first published in July 2009.